As with other aspects of behavior, moral behavior must be taught. One element of such behavior is the ability to empathize with others, to put oneself in someone else’s shoes. Obviously, empathy can help inhibit anti-social behavior. There is some evidence that empathy is part of a child’s in-born temperament, and that some children are naturally more empathic than others. 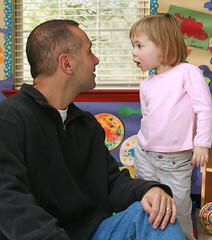 However, research also shows that empathic parents tend to have empathic children. So this important attribute is clearly shaped by example and teaching as well as by genes. The ability to show children what it is to care about another’s well-being – physical and emotional – is central to teaching morality. It is also central to their self-control and their long-term ability to form lasting relationships. Many childhood games are valuable for teaching connectedness, turn-taking and awareness of others. Peekaboo is a great example.